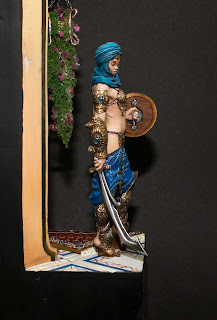 Monte san Savino miniature contest. Unfortunately i haven´t got a medal but it was the first time that i´ve submitted in Master painting category at the MsS Contest. I think or it is better to say i hope that it was close. I am sure it was very very close!!! AND IT IS DEFINITELY YOUR BEST PIECE!!!! THE RUG! THE RUG! THE RUG! ;) Great Piece! Very nice work here Kurt! It really was my pleasure seeing your big progress in this figure. She is beautiful and the detail is lovely! I think it's an amazing piece of work! Too bad you didn't receive a medal. I especially like her skin. It looks so soft and smooth!